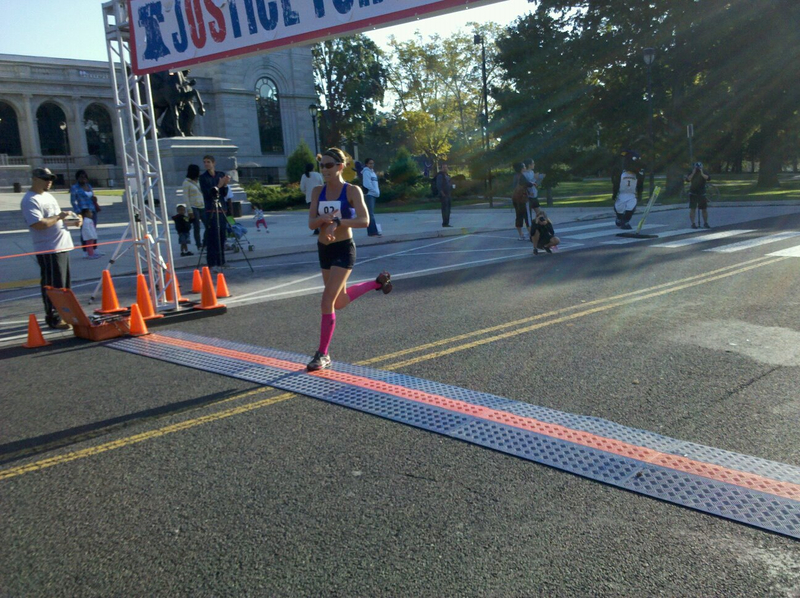 On Sunday, October 9th 2011, I woke up early to run the Community Legal Services of Philadelphia’s “Justice for All” 5K Race. It was a chilly morning, and I honestly did not feel like rolling out of a warm bed to race in the crisp autumn air. This was my second 5K ever, having placed 2nd in the 5K in July. While I decided my goal was to aim for a sub-20 minute 5K, I was more excited to be part of a race where Chris was hoping to set a PR, and his Uncle Al was attempting his first race in over 20 years!!!! Loving to race as much as I do, I was super pumped to witness another person enter the ranks of runner and racer. Waiting for the start of the race, I nervously set my Garmin to a 6:25 pace – which I changed the last minute to 6:30, as I honestly had no reason to believe something so fast was possible. My training hadn’t been geared toward a short race or speed-work, and in the previous 5K I ran 6:37s, so 6:25s sounded not only overly ambitious, but downright foolish! At the sound of the gun, I lunged forward and told myself that no matter how much this race hurts – its ONLY a 5K. It would be over soon. To my shock and horror (I immediately figured I’d gone out too strong! ), I was the front-runner. For the entire 19:15 it took me to complete and win the 5K, I never had another female by my side or in front of me. It was quite an odd sensation. To keep me focused and maintaining pace, I worked to slowly pick off the male runners in front of me. I knew I had to run as though I had a target on my back – especially for the final mile. Strategically, it’s always easier to be in a close second place, and to come from behind. Being the leader, I knew that there was a very good chance that a competitor was planning on closing in on me towards the end. Refusing to use any energy to turn my neck and look behind me, I dug deep, kept complete control of my breath, and focused on my stride. Though my body was close to tapped out, my mind and focus was oddly calm. As I neared the finish line, I let the cat out of the bag and picked up speed. I knew that at that point, first place was mine to lose, and I didn’t fight so hard for 3 miles to lose in the last .1 mile. Though I knew I won, it really didn’t hit me. In fact, I was more proud of smashing my pervious 5K and surpassing what I truly thought I was capable of: running a 6:17 pace for a 5K! It turns out the second place female was a whole 47 seconds behind me, and I was in no danger of losing at the end. Chris set a new PR too, as did his Uncle! Cheering for them and watching them both achieve their goals left me grinning from ear to ear. I felt silly when I was awarded a trophy and prize, as I don’t like being the center of attention unless I’m a character on stage or on a photo shoot. With no character or mask to hide behind, I would prefer to quietly leave and celebrate my achievements on my own. As Chris and I celebrated our successful race over two mountains of challah french toast, I couldn’t help but wonder what it would take for me to run a 6:10 pace 5K. At the end of the day, win or lose, I just want to be the best I can be. And you can bet I’ll be doing it with the biggest smile you’ve ever seen on a runner. ~ by Elizabeth on October 17, 2011.